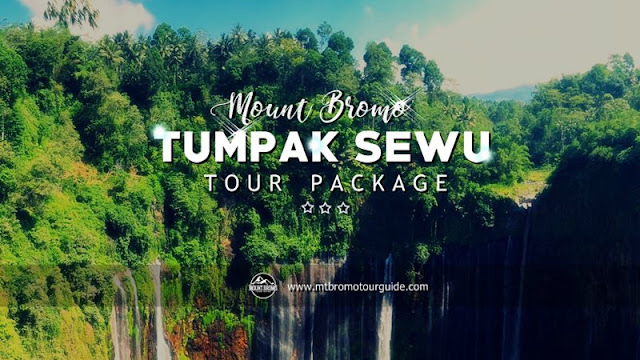 Mount Bromo Tumpak Sewu Waterfall Tour 3 Days 2 Night also called Coban Sewu Waterfall is a travel package to enjoy Bromo sunrise then continued with a sense of adventure to the Tumpak Sewu waterfall located in the border area Lumajang and Malang regency from Surabaya, Malang or Banyuwangi Port. 3 days 2 nights Mount Bromo Sunrise tour and Coban Sewu Waterfall will included 2 nights accommodation around Cemoro Lawang for one night, which then the next day will proceed to Lumajang to Coban Sewu waterfall tour package. Tumpak Sewu Waterfall or Coban Sewu is a 120 meter high waterfall located in Sidomulyo Village, Pronojiwo District, Lumajang District, East Java, Indonesia. It is the most beautiful of Tumpak Sewu waterfall in Java Island and Indonesia. Because this destination has a unique formation because it has a wider flow of water like a curtain. Our tour driver will pick You up in Surabaya, Malang (Airport, Train Station, Hotel) then take You to hotel around Cemoro Lawang Mt Bromo for 3,5 hours. After Check in, Stay 1 night. Enjoy the crater views until finish Mount Bromo Sunrise tour and comeback to your hotel around Mount Bromo, Have breakfast, take shower and relax enoughly. 10.30 AM, Reach the Tumpak waterfall location, Enjoy your trip for various falls steaming down appears from the up ground. Finish enjoy Coban Sewu waterfall trekking package, Return to your homestay around Coban Sewu, have lunch and comeback to Surabaya Airport for 5 hours and trip is finish Mount Bromo, Waterfall tour. For detail information about Mount Bromo Tour Package price,and accomodation around Cemoro Lawang, please call via contact us. Thank you.